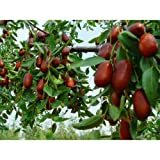 Chinese jujube tree for sale – Easy plant to grow, with edible fruits and also can be used as edge plant, planting in winter to spring, better to buy grafted tree or another option to start from seeds yet more problematic it’s impossible to ensure the quality of the fruits. Growing information: perennial plant, growing hardiness zone: 5-11, water needed – small to average amount, light conditions – full sun to partial shade, height: 3-10 m 10-33 feet (but better to keep the plant small. Blooming in the spring in star shaped flowers that appear in white to yellow color. Fruit edible, harvest summer to autumn, oval shaped flowers that appear in green to brown color, fruit used raw, dry or beverage. 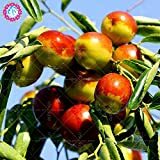 Chinese jujube tree for sale – What are the varieties of Chinese jujube tree, recommend buying? Chinese jujube tree for sale can be a lot of varieties there are not known varieties that have small seeds big and sweet fruit, there are more sweet or more sour fruits it depend in what you like, the most common varieties is: Lang jujube, Li jujube, jujube tree honey jar.